This Villa is a new modern villa located just 100 meters away from Long Beach. The Villa offers a swimming pool area with sunbeds and showers, a comfortably furnished terrace with a dining and seating area for leisure activities. There are two spacious, well-lighted, air-conditioned public spaces, 75 square meters each, with kitchen, dining and living room, and a work space on the first floor. 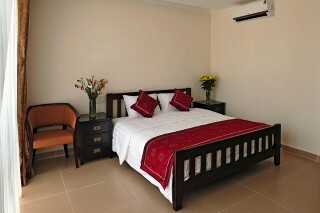 Villa rooms are cozy bedrooms with one or two beds, depending on your choice. Each room is between 23 and 26 square meters. Each room has a private WC, a shower or a bath. A set of cosmetics, bathrobes, slippers and a hair dryer are provided for you. 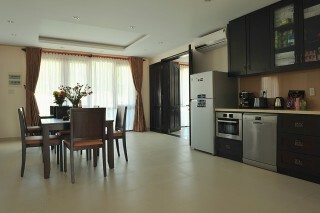 There is a large plasma TV with satellite channels, safety deposit box, minibar and an electric kettle. 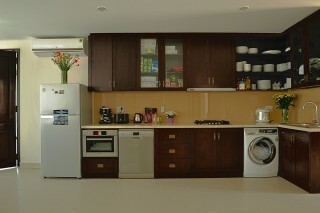 SERVICES : We provide a four star service for our Villa guests. To make our customers stay care free stay and pleasant we offer the following services : MINIBAR IN EACH ROOM DAILY HOUSEKEEPING FIBER-OPTIC INTERNET SATELLITE TV Kitchen , dining area, pool, Sitting Area all are common The kitchen is equipped with everything necessary for comfortable living: a large refrigerator, washing machine, dishwasher, microwave, oven, hob, coffee maker and toaster. All utensils and accessories for cooking are available. 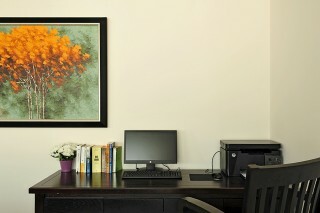 The work space is organized with a computer desk and comfortable chair, a PC with high speed Internet access, printer and scanner. There is a cozy relaxing area with a large-screen satellite TV, and a karaoke machine is set up in the spacious living room. All the furniture in the Villa is made from natural oak. This Villa is located on the territory of Sunset Sanato complex, 4 km from the international airport and 7 km from the center of Duong Dong town. 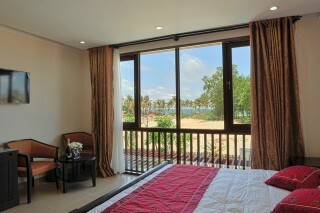 It is just 100 meters away from the longest beach in Phu Quoc Island - Long Beach. On the complex territory is a unique tourist attraction - the temple of the whale. Nearby are several pearl farms that grow famous Phu Quoc pearls. 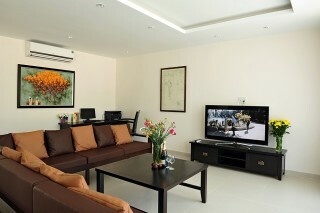 The nearest airport is Phu Quoc International Airport, which is 4 km from this Villa.